Dropped into on of my clients yesterday and they mentioned they could not print to the printer. Sure enough the display on the printer showed Paper Jam. Even though they assured me they had already gone through the printer and could not find any paper jammed, I started opening all the panels. Nothing in the toner area, nothing in the paper feed area, but at the back of the printer where the duplex area is where I found those items shown above. Yes, those are leaves. Dried leaves. Here eyes opened wide and then she started to giggle. 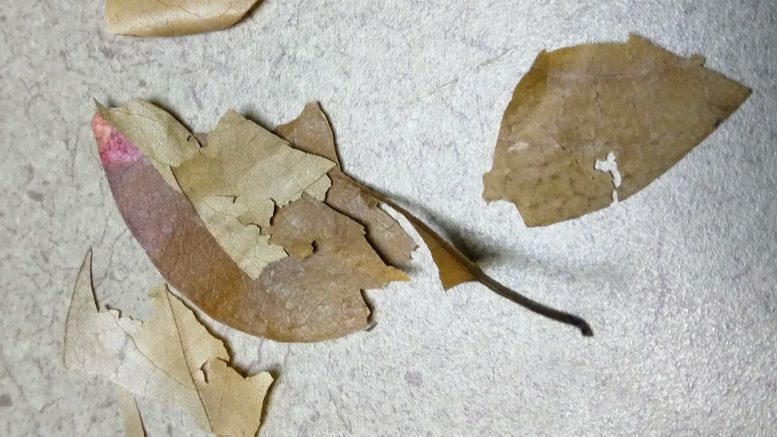 She explained she had been using the stack of printer paper to press leaves – it was good and heavy. Turns out one of the other staff had somehow picked that ream of paper – along with the hidden pressed leaves, and everything went through the printer. Of course, I could have asked why you would be pressing leaves at the office, in the middle of winter – but I chose not to. Be the first to comment on "Printer Maintenance Fun"